A 6-day exclusive women Leh Ladakh road trip in group vehicle covering all the amazing attractions of the region. Fixed Departures: Departure available for even a single person on the available dates. Car Rent and Fuel: For the SUV, car rent, as well as fuel, is included in the price. Comfortable Stays: All accommodations during the ride in comfortable hotels and deluxe camps. All with attached washroom. Hidden over high passes in an arid, largely treeless rain shadow, Ladakh is classic Trans Himalayan scenery: huge khaki-coloured valleys and harsh rock walls brought alive by the occasional splash of irrigated green. Traditional Tibetan Buddhist culture remains intact here, with spectacularly located monasteries that burst into life during medieval masked dance festivals that have changed little in 500 years. For travellers, there's a bit of everything – epic treks, sparkling high-altitude mountain lakes and a well-developed backpacker infrastructure based around the capital, Leh. On your arrival in Leh, you will meet your hosts at the airport and will be transferred to the hotel which will be pre-booked by the ground team. You will check-in to the hotel for a complete day rest and for acclimatization to the rarified air. Enjoy some lunch at the hotel if you would like and then in the evening visit the Leh Bazaar and witness the Sunset at Shanti Stupa. After an early morning breakfast, you will be driven towards the east of Ladakh to visit Alchi Monastery (958-1055 feet) which is about 70 km east of Ladakh. Alchi Monastery is located on the Srinagar- Leh Highway (NH1) and is situated on the banks on Indus river, it is said to be the oldest and the most famous monastery of Ladakh. On this drive back you will also take a tour of Sangam (confluence of 2 rivers, Indus and Zanskar) and Magnetic Hill (the hill that defies the gravity), Hall of Fame (museum constructed as well as maintained by the Indian Army in the memory of the soldiers who had lost their lives during the 1999 Indo-Pak wars) and Gurudwara Pathar Saheb. You will be staying overnight at the same hotel in Leh. Today, early in the morning, the road trip to Nubra Valley will start. It is 125 km from Leh en route the world highest accessible road Khardung La (18,379 ft). You will reach Diskit (headquarter of Nubra valley) by noon and check in at the hotel/camp. In the evening, you will be visiting Diskit Monastery, and Sand dunes in Hunder Village 7 km from Diskit Village and take a ride of Double Humped Bactrian Camels. Dinner will be served and an overnight stay will be conducted at the hotel/camp. In the morning you will visit Diskit Monastery and be driven back to Leh by same Route, crossing Khardungla Pass. Today you will be camping overnight in Leh. Leave for Pangong Lake 14,500 ft, through Changla Pass 17,350 ft. (second highest motorable road in the world). Post lunch at the lake and you will be driven back to Leh via the same route visiting Thiksey monastery. You will be staying overnight in Leh. The last leg of your tour, in the morning, after an early breakfast you will be dropped at the Leh airport to fly back to your onward destination with some beautiful and memorable memories. Accommodation on all days at twin/triple sharing basis in camps and hotels. Road trip as per the itinerary in a group non-air conditioned vehicle. Entrance fee for monuments and monasteries. Any travel expenditure to reach Leh. Any cost arising due to natural calamities like landslides, roadblocks etc to be borne by the client directly on the spot. Avoid bringing or using polythene bags as it is strictly banned in Leh & other areas. All personal garbage like pack lunch boxes, wafers, mineral water bottles etc. must be brought back to your hotel, as littering is prohibited in Leh & other areas. Always take off your shoes before entering a monastery chapel. Take permission from the monks before taking photos inside the monasteries. Avoid offerings sweets/tips etc. to local children. Always take clockwise direction while visiting Stupas and Monasteries. Smoking/drinking around religious shrines is not welcomed. The 10% booking amount is non-refundable (if the customer chooses the part-payment option). A female tour captain can be arranged "On Request", the same cannot be guaranteed. A couple of water bottles. Other essentials: paper soap, toothbrush. Toothpaste, comb and toilet paper. Warm jacket for the night. Chargers for all the gadgets. Valid Government approved photo ID. Mobile phone connectivity: Only post-paid mobile phone connections from other states work in Ladakh and even from these, only BSNL has a presence beyond Leh. So unless you wish to be dependent upon STD booths, carry a BSNL/MTNL post-paid connection. 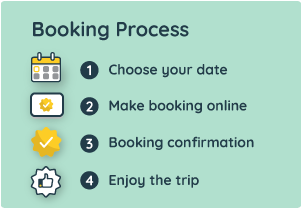 The operator details and phone number will be shared in the booking voucher send to you via email post making the booking.